Diane Kruger portrays the victim of terrorism in the film. She is an international actor who has appeared in American films (“Inglourious Basterds,” “National Treasure”) and completely owns the tenor of what happens in this period of her character’s life. It is a classic collaboration between her and the director/co-writer Fatih Akin, running through a horrid laundry list of dreaded emotional reactions, while also expressing the toughness and need-for-help that is necessary to survive. As a statement about terrorism, it is an ultimate one in a sense, as to where we will all end up if it continues. This film will both make you think and possibly elicit a call to change within that thought process. Katja (Kruger) is a German woman who has married a Turkish immigrant (Numan Acar). They have a son (Rafael Santana), and are rehabilitating their past lives, which involved drugs and prison time. Katja’s existence is shattered when a bomb is set off in front of her husband’s place of employment, and both her husband and son are killed. Her victimhood is set against a series of attempts to come back the world. She does revert back to self medication through drugs, and her lawyer (Denis Moschitto) prepares the case against the alleged terrorists, a couple linked to Neo Nazis. But there is something else that Katja wants to do, and it involves her own investigation and action. Kruger is the cosmic glue in the film, every moment flows through her character and how she embraces the circumstances. It is a remarkable performance, in the sense of how she communicates the difficult feelings of mourning, recovery and determination. She and director Akin have created an atmosphere in her role, as in every situation Katja embraces is blanketed with her presence. It’s mesmerizing, and has a darkly ethereal effect. Immigration is at the forefront with the story as well, and Germany has been dealing with an enormous influx of refugees and fellow travelers, as well as the blowback of hatred that has shades of their social fascist past. It’s as if Germany – in its checkered history – is the centerpiece for all of civilization’s sins, the need for “territory” versus the hopelessness of desperation for displaced persons, and the clash that occurs when these two factors converge. The law, as depicted in the trial against the alleged perpetrators, is also a focus of interest in the story. There are two distinct sides to be judged, and the parsing of legal language – that tends to serve bureaucracy over humanity – is intently exposed. That becomes as fascinating as Katja’s grieving, and the two come together to to shift the direction of the film. For example, in the trial scene where the gory injuries of her dead son are read out loud, Katja refuses to leave. After that difficult moment, the harm she does to herself is irretrievable. This film won the Golden Globe as Best Foreign Language Film at the recent ceremony, but amazingly was snubbed in the recent Oscar nomimations. 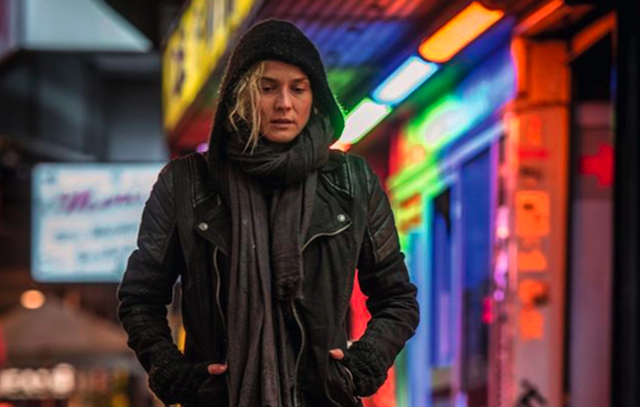 Awards aside, “In the Fade” is a modern horror story for all of us, as we exist in the the 21st Century, watching the time go away.